When you become a new parent, a vast array of choices about your lifestyle become more important than ever before. Taking responsibility for your little one means putting their safety and development first. When you consider your sleeping arrangements with a newborn, a co-sleeper is a fantastic choice. Allowing the parent to be close to their baby promotes a healthy breastfeeding relationship but also provides a separate surface for the infant. This separate surface can supersede any worries about possibly smothering or hurting the baby, while still allowing the parent to be close enough to respond to all of the baby’s needs. Which style of co-sleeper or bassinet is right for you? Read on for our picks of the best on the market. This Arm’s Reach Concepts Co-Sleeper Bedside Bassinet is our gold standard for co-sleepers. Co-sleepers are by design, only supposed to be used until your infant starts pushing up. Usually this occurs between 3-6 months of age, which might make some parents hesitant about investing in a co-sleeper as opposed to a crib which can be used for much longer. Arm’s Reach solved this problem by making this bassinet not only an attachable co-sleeper but also a stand alone bassinet and a Playard, all at a reasonable price. Designed to be attached to an adult bed of any height, this co-sleeper will also take up much less room than a crib, making it a perfect fit in smaller bedrooms or apartments. Should you have a bed that stands taller than 24 inches, an extension kit is available for separate purchase to fit the bassinet securely to the side of your bed. Also available as add-ons are extra fitted sheets for the smaller Arm’s Reach mattress. This bassinet attaches to the side of an adult bed with straps that go between the mattress and bedsprings. 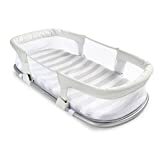 They’re attached to a plate that allows for easy adjustments, so you can tighten and loosen the straps to adjust the bassinet securely to the side of the bed, or easily loosen it to make the bassinet stand alone or to wash sheets and for cleaning purposes. The ease of loosening these straps makes it easier to make your own bed before tightening the straps again when you are finished, therefore not allowing a gap large enough for the baby to fall through while be lifted into the parent’s bed. On the side of the padded polyester bassinet, there is a lip that allows the parent to easily lift the baby into the adult bed for feeding and bonding. The Arms Reach bassinet includes a mattress pad and fitted sheet that are firm enough for newborns but comfortable enough to not wake your infant when moving them back to their surface. Since the surface where your baby will be sleeping is so much smaller than a crib mattress it’s a much more appropriate size for a tiny newborn than a larger model. You can imagine the size of the surface of the mattress by looking at a king-sized pillowcase, and see that while it’s big enough for baby to shift a little, they’ll still be fairly contained in a much smaller sized mattress than a crib. Aesthtically, this co-sleeper is not an eye-sore in a master bedroom. 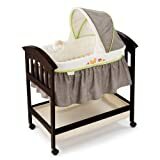 It’s offered in both a natural beige and cocoa color, and the compact size doesn’t make the bassinet the main focus of the bedroom. The size also allows this to be a perfect bassinet to bring with you when you travel. It’s 28 pound frame and 31 inch tall side are easily foldable for travel, though there is a small learning curve you’ll go through when learning how to most efficiently pack and then re-assemble it. Included with the co-sleeper is a bag for transport which makes packing a breeze. Despite it’s small size, the Arm’s Reach bassinet is made out of quality materials that make it feel very sturdy. The price point is very good especially considering its multiple uses. Coming in at under $200, and as low as $139 on Amazon, this is a quality and affordable solution for new parents, and definitely one of the items you’ll be able to re-use with a second child. Many parents will spend a fortune decorating a child’s nursery before they are born, but the reality is that your newborn really won’t want anything more than to be close to you. Arm’s Reach is a company that was founded by two parents who wanted to safely co-sleep and keep their children close by, and their products have won numerous accolades from magazines such as Parenting and Fit Pregnancy. Coming in second place in our round up of the best co-sleepers for newborns on the market is the Summer Infant ‘By Your Side Sleeper. If you love the idea of co-sleeping and are looking for a great option that can actually go into your adult bed, this is a fantastic solution. The By Your Side sleeper may be small, but it’s also exceptionally strong with a sturdy metal frame. This co-sleeper would be placed in the middle of two sleeping parents, or on the side of a bed against a wall since it does not fasten to the bed. If your bed happens to be low and near to the ground anyway, you could put it on the floor next to you. This might seem like a drawback, but it can also be a tremendous advantage if you need to get on with your day but the baby is still snoozing. You can easily pick up your entire bundle of joy and move them into the next room with you. The entire unit weighs only 7 pounds, and is 32 x 14.5″ x 11″. But because of the strong metal frame, it’s actual weight capacity is a hefty 96 pounds. Rest assured that your newborn won’t get quite that big in the 4-6 months they’ll be using it, but that the utilitarian co-sleeper can carry a heavy load. Designed to be strong and small, this seems like a very safe solution for co-sleeping with your baby. The materials of this co-sleeper are quality, and the color is subtle and fits into any decor. White mesh surrounds the sides which has excellent visibility to gaze at your little one. It also makes this a very well ventilated co-sleeper and allows for air circulation on the sides and underneath your baby. Better ventilation reduces any risk of over-heating which would also make this a great solution for parents living in hot climates. The mesh on the side and base of the bassinet are also water-proof, adding another element of convenience into this simple design. Late night diaper explosions will be much easier dealt with thanks to this feature, and the entire co-sleeper will dry faster thanks to the ventilation the mesh offers. Despite this advantage of amazing ventilation, the mesh could potentially be a target for pets looking for a comfortable place for a nap, and the material might not fare well if you have an over-zealous cat. Summer Infant also offers an additional deluxe attachment unit with lights, sound, and vibration. This attachment fits onto the basic unit easily. The entire unit without the deluxe attachment on folds in half making it an excellent co-sleeper to bring with you while traveling. The high sides of the co-sleeper are high enough to where you will be reassured that your baby is not going to roll or slide anywhere. The price is also reassuring since this a product your baby will not be sleeping in past the time they start pushing up. On Amazon it’s listed at $71. But because of it’s neutral and attractive design, you won’t mind hanging onto it to use with any future children. Summers Infant also carries a wide array of other baby items such as changing tables, baby gates, and baby monitors to name a few. Their theme is, as you could guess from the name, very light and airy and adds a tasteful and modern elegance to any decor. Coming in at third place in our co-sleeper competition is the more classically styled Summer Infant Classic Comfort Wood Bassinet. This is a beautifully designed bassinet with all the bells and whistles. The Fox and Friends collection has some adorable imagery that’s embroidered on the quilting for the bassinet. Because Fox and Friends is featured on several items in the Summer Infant Collection, you could easily use this as just a piece in a beautifully themed nursery. This co-sleeper is a bassinet in that sits in a hardwood expresso colored frame. The frame itself sits upon wheels so that the unit can be moved easily between rooms, but if you have an entirely carpeted home it might not have the most fluid movement. The wheels lock when not in use to prevent the unit from being shifted by your baby’s weight or movements. As with all bassinets ideally this would be best in one room, especially because it also features a large storage basket underneath. It’s a freestanding bassinet, so a parent that wanted their baby by their side would need to evaluate what kind of space they could open up next to their bedside to place this unit. The height of the unit places your baby’s mattress at just about the side of your adult bed’s mattress, and the entire bassinet weighs 15 pounds. The canopy on the top of this Summer Infant bassinet is fully adjustable so that you can block any lighting that might wake your baby from their sleep. This is an attractive feature since you can be in control of your baby’s environment even when moving them from room to room. To further create a soothing routine for your newborn, there are a variety of tunes and sound themes that can help calm your baby. The music unit has four sweet songs, two tranquil nature soundtracks and even a realistic womb sound that will make your baby feel like they are still in utero. This bassinet even has a vibration function which can lull your baby into even more relaxation. All of the automated features are on a 20 minute timer to save battery life, and the unit takes three AA batteries. This timeless piece is made of 100% real hardwood which blends in perfectly to any decor. If you are buying this piece as part of a complete home collection, you can match it to a classic comfort wooden highchair, a multi-function Playard and changing station, and a cushioned musical bouncer or cozy musical swing. The quilted embroidery and skirt of the bassinet is gender neutral but very sweet and endearing. Priced at between $120-140 based on the retailer, the classic bassinet is also easy to assemble, making it a favorite choice amongst parents that are assembling their baby gear at the end of pregnancy! The sweet theme of Fox and Friends is embroidered all over the removable mattress sheet which is included and fits the mattress, which is also removable. All in all, it’s an adorable and functional choice for your newborn first few months, and that you’ll want to hold onto for future generations to come. If you are looking for a co-sleeper that can go in your adult bed and not break the bank, our budget pick of the SwaddleMe By Your Side Sleeper could be a great option. It’s very reasonable to want to spend less on an item that could only be used for five months and at the very most seven months. This co-sleeper is small and light, it weighs in at only six pounds and is 32 inches long (complete dimensions are 14.5 x 32 x 11 inches, it’s important to consider them and the size of your adult bed before purchase). This co-sleeper is not fitted to a stand of any kind so it’s designed to go right in between you and your partner in your bed, or on the floor next to your bed if you prefer. The solid metal frame folds completely flat making it an excellent choice for traveling with baby. The sides are covered in a white mesh for a clear view of baby and to promote good air circulation while they are inside sleeping. SwaddleMe also added a removable mattress pad and fitted sheet made of soft polyester and cotton for your baby’s comfort. Because of the sturdy frame, you can rest assured when your baby is next to you in bed that no movements by you and your partner will upset or wake the baby. This is our budget pick but it does come with a more deluxe option. The basic bassinet comes in at around $40-50 on Amazon, while the deluxe attachment will cost you about $70. It’s a detachable light, sound, and vibration unit that features nature sounds and a heartbeat track to help your little one feel more comfortable when they are in the bassinet. Studies show that infants that are swaddled and close to a comforting sound like a heartbeat or sonar are more easily soothed than those that don’t feel they are still in the womb. Because of its small size and easy to pack design, this is an excellent choice to have as an extra bassinet for grandparents as well. If you wake and your baby is still sleeping, you can easily transport them safely out into another room where you can keep an eye on them. The gender-neutral design makes it an easy addition to any nursery or decor collection. How do you feel about co-sleeping? If the answer that you are not a co-sleeping household than likely only one of these products will appeal to you, the stand-alone bassinet. In the United States particularly there is a huge stigma and fear of co-sleeping. This is based in part on several inaccurate studies that linked co-sleeping to SIDS. However further research has shown that as long as common-sense safety measures are in place co-sleeping is safe. Trust your instincts about what feels safe and right for your family. It’s important to think about these questions in pregnancy and do some research so you can feel like you have a game plan once the baby arrives. Pregnancy and birth are only the first of many questions you’ll have to carefully weigh in order to keep your entire family happy and healthy. Will you be traveling with this co-sleeper? One of the many benefits of owning a co-sleeper bassinet is the flexibility it gives you in those first few months for travel. By making your baby comfortable and close to your side with a co-sleeper basket, you also don’t have to worry about crib arrangements when visiting family or friends. Your baby will be more comfortable in a familiar environment and you’ll be able to be more adaptable to travel ideas should you wish to travel. Models that can fold completely can be re-opened wherever your baby needs to nap. What theme are you choosing for your nursery? Not only is it fun to think about designing a baby nursery, but it can also really simplify things if you can try to come up with a theme for your nursery before you invest in too much gear. Some parents will love the idea of an entire ongoing theme throughout the house, and others won’t feel a need to coordinate items at all. Regardless of what you decide to decorate or modify for your baby, there is something very sweet and sentimental about putting a newborn down in a small bassinet that will only be used for a few months of their lives. Having items be gender neutral and easy to be moved throughout your home without creating an eyesore should be a big consideration when picking a bassinet. Buy something that you feel will be not only versatile but also special to you. If you can buy something that fits into the decor of your home, you’ll be happy to hold onto it and pass it on to other family or even grandchildren. Quality never goes out of style. What’s the most durable choice? Most modern bassinets are fairly durable, but changes in your own personal living situation (your location, space requirements, pets) might impact the durability of your bassinet. Ventilation will not only keep your baby safe but also help keep your bassinet fresh and clean when not in use. Nothing will make you want to toss a piece of baby gear faster than mildew or mold. A solid wooden frame is a classic and very durable style for a bassinet but could be a problem for parents living in apartments or homes with little storage if they want to hold onto the unit long-term. Because of this the unit can become less durable over time if not stored properly. 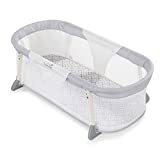 The solid steel framed bassinets store easily and can double as laundry or toy baskets once your baby is pushing up and being graduated to a crib. As a parent, our prime concern is for the safety of our children. Our emotions as parents are extremely intense in the period of time after birth and post pregnancy, right around the time we are selecting and placing our precious new arrivals down for a good nights sleep. The good night’s sleep might be a truly optimistic thing to wish for when you start your life with baby postpartum, but many parents feel more connected and like they get more rest when they co-sleep. Buying a co-sleeper with a separate surface or a bassinet that can be close to your bedside will significantly improve your chances of a healthy breastfeeding relationship. When a mother is close to her baby she can more easily pick up on cues that her newborn is telling her. When this continues during the night a healthy milk supply is established, and moms actually get more rest because they aren’t getting up from bed every time the baby needs feeding. Because of the separate surface they offer, co-sleepers and bassinets are a wonderful addition to your home. Despite their difficulties of early parenthood, you’ll remember fondly the sweetness of your child as a newborn and the bassinet you lay them in when they finally went to sleep.